Aims To describe the course of depressive symptoms during the first year after diagnosis of Type 2 diabetes. Methods Post hoc analysis of data from a randomized controlled trial of self-management education for 824 individuals newly diagnosed with Type 2 diabetes. Participants completed the Depression scale of the Hospital Anxiety and Depression Scale after diagnosis and at 4, 8 and 12 months follow-up. Participants also completed the Problem Areas in Diabetes scale at 8 and 12 months follow-up. We present descriptive statistics on prevalence and persistence of depressive symptoms. Logistic regression is used to predict possible depression cases, and multiple regression to predict depressive symptomatology. 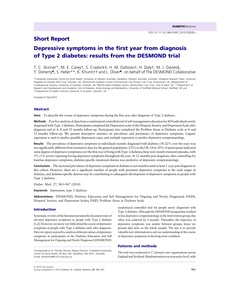 Results The prevalence of depressive symptoms in individuals recently diagnosed with diabetes (18-22% over the year) was not significantly different from normative data for the general population (12%) in the UK. Over 20% of participants indicated some degrees of depressive symptoms over the first year of living with Type 2 diabetes; these were mostly transient episodes, with 5% (1% severe) reporting having depressive symptoms throughout the year. At 12 months post diagnosis, after controlling for baseline depressive symptoms, diabetes-specific emotional distress was predictive of depressive symptomatology. Conclusions The increased prevalence of depressive symptoms in diabetes is not manifest until at least 1 year post diagnosis in this cohort. However, there are a significant number of people with persistent depressive symptoms in the early stages of diabetes, and diabetes-specific distress may be contributing to subsequent development of depressive symptoms in people with Type 2 diabetes. © 2010 Diabetes UK.